There are many diets and many work out programs today. People are always trying to find the best way to be healthy. At times trying to whip yourself into shape can seem impossible. Drew Manning is a personal trainer from Utah and he is going the extra mile to show that you can lose those pesky pounds and eat right. In May he started an unprecedented journey that has gotten worldwide attention. He was tired of hearing that he didn’t know what it was like to be overweight or unhealthy. So, he decided to start the journey of fit to fat to fit. He quit exercising and quit following his strict diet. He started eating without restriction and even let people choose meals they wanted to see him eat. After six months of an unrestricted diet and gaining more than 70 pounds, he has started his journey back to fit. Manning appeared on The Jay Leno Show and Dr. Oz where he shared his experience of exercising and breaking his new addiction to Zingers and Mountain Dew. Manning has taken the phrase “lead by example” to heart. Rather than sitting on the sidelines coaching people about fitness, he is on the front lines showing them by example that it can be done. He is demonstrating an excellent way to communicate. People can understand more when they are shown rather than told what to do. People of all professions can learn a thing or two about Manning’s message. I for one am looking forward to seeing him accomplish this goal and see the many people he will inspire. 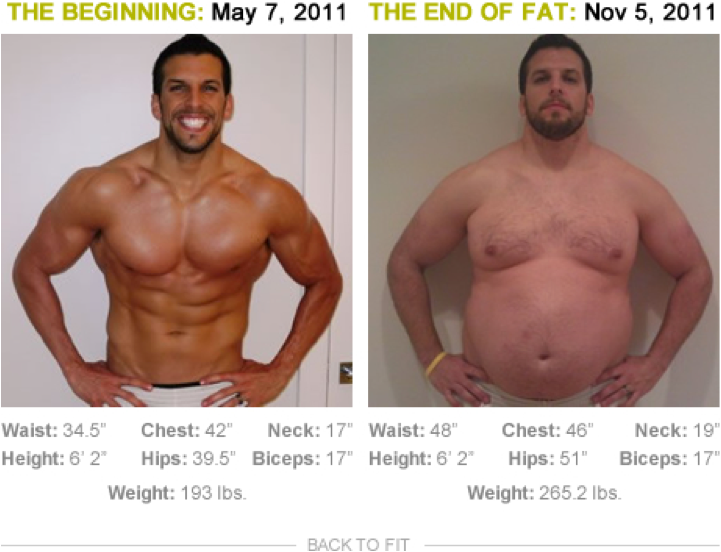 You can follow his journey at http://www.fit2fat2fit.com/. P.S. Thanks to our long distance intern Jeff Larsen for this post. Have you ever wondered what presence you have online? There is a way to find out. 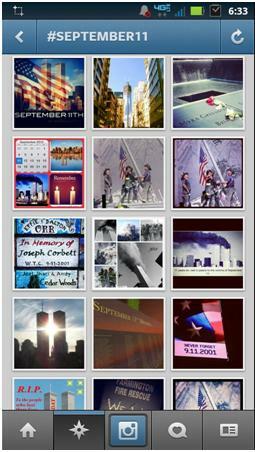 Klout.com is a website that will measure your influence across your social networks. It takes your Facebook, Twitter, Google+ and any other social media sites and gives you a score. It uses variables from these sites such as friends, followers, retweets and posts. It measures these variables and gives you a score in three areas. Your true reach (how many people you influence), amplification (How much you influence them) and network impact (The influence of your network). It then combines the three scores and gives you a final score on a 1-100 scale with 100 being most influential. Your True Reach is the number of people you influence. When you post a message, these people tend to respond or share it. Your Amplification is how much you influence people. When you post a message, how many people respond to it or spread it further? If people often act upon your content you have a high Amplification score. Your Network indicates the influence of the people in your True Reach. How often do top Influencers share and respond to your content? When they do so, they are increasing your Network score. I’m sure by now you are at least a little bit curious about what your score might be. 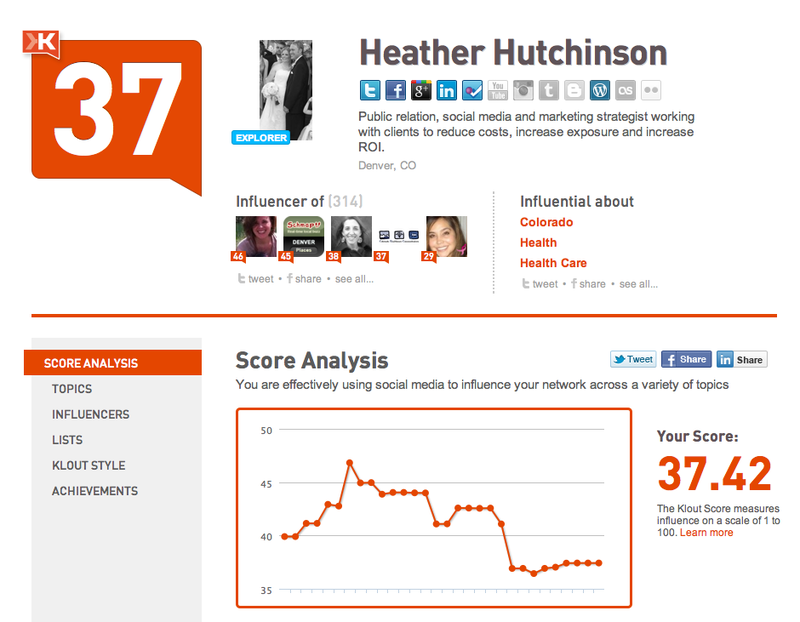 You should go play around on Klout.com and find out what your score is. Link it to your Facebook, Twitter, Google+, blog, LinkedIn and all your other social media sites to make sure you can get a score for all the sites you use. Your score isn’t always going to be the same. You may sign on one day and be up a few points because more activity has been going on in your social media world and other days it may be down a few points because of lack of activity. You need to be consistently active in your social media to keep your Klout score increasing. What is your Klout? Mine currently is 37. Share with us what you think of Klout and if there are other services that you think are more valuable. Are we ready for flu season? Are we ever going to have a worry-free season? In summer, we liberally apply sunblock to prevent skin cancer. In winter, we wash our hands often to fight against viruses. The spring brings pollen and allergies to battle and of course fall is the best time to get vaccinated against common flu. With flu season right around the corner we wanted to bring attention to public health communication in social media by taking a look at a successful campaign. Social media has become an integral part of immunization communication for many public health organizations, nonprofits and health care providers. 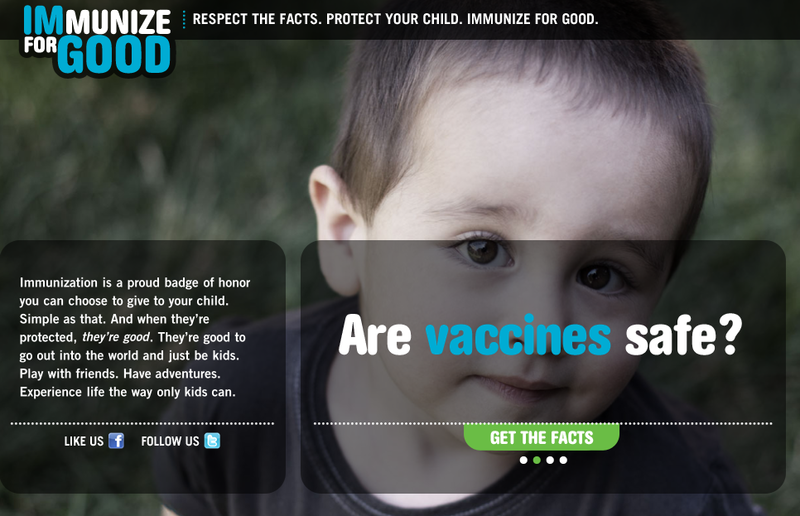 The Colorado Children’s Immunization Coalition (CCIC) has created an award-winning campaign, Immunize for Good, designed to answer parents’ toughest questions about childhood vaccines and reinforce a parent’s choice to vaccinate. As a statewide nonprofit, CCIC works with community organizations, health care providers, public health departments, businesses and policy makers to ensure children get the vaccines they need to keep Colorado healthy. A 2010 national survey shows that while 88 percent of parents follow the CDC-recommended vaccine schedule, more than half, 54 percent, have concerns about vaccines. In response to these concerns, CCIC, in partnership with the Colorado Immunization Program and the Vaccine Advisory Committee of Colorado, launched this exciting and content-rich social media campaign in order to encourage parents to vaccinate and reassure them that they are making the best decision for their child’s health. Parents were informed about the benefits and potential side effects of the vaccinations thru Facebook and Twitter. The campaign was very successful, helping increase awareness of new studies proving the safety of immunization and helping answer questions for concerned audiences. This campaign showcases that social media can be a powerful tool to raise awareness for public health organizations and health care providers. To learn more about what CCIC did to make a successful communications campaign, visit them on Twitter or follow them on Facebook. If you are looking for a way to learn more about social media and health communications, join me for a Coffee Talk session with the Colorado Healthcare Communicators on Wednesday, September 28. I’d be happy to discuss your organization and how social media might help reach your target audiences. What does Coca-Cola mean to you? It is not just a big brand, Coca-Cola understands how to connect with the heart of buyers. 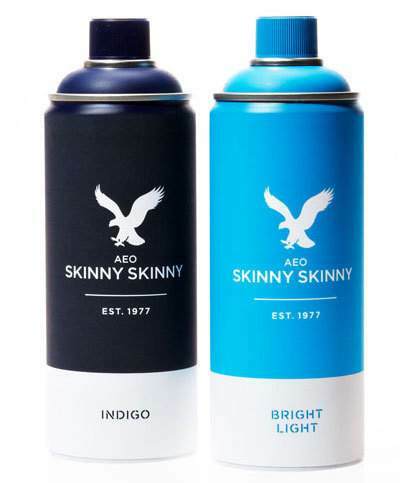 Their marketing campaigns WOW. They spend marketing dollars by giving back to customers and create a strong relationship with their audience with various unconventional marketing efforts. Imagine a college student wants to get a coke from the vending machine but ending up getting more than she bargained for. In Coke’s most recent campaign, students get flowers, pizza, and even a huge sandwich from the vending machine. The Coke machine dispenses more than Coke product, it dispenses good will and happiness. The viral nature of the happiness machine encourages consumers to create a true relationship with Coke. By establishing good will with consumers, especially in emerging markets, consumers will choose Coke because they like the brand – not to mention the taste. What do you think about Guerilla marketing? How would it help your business get more attention? Tell us what was your favorite unconventional guerilla or viral marketing campaign was and share with us on Facebook at Weise Communications, follow us on Twitter @Weise_Ideas. Thanks to Duysal Ekinci for her help with this blog entry. We found out this week that the White House Press Secretary, Robert Gibbs, is out to allow for some fresh air in the press room. I read a lot of comments online about his skills, or his lack there of, with the press. 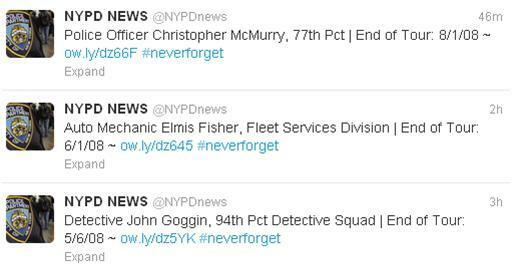 Regardless of your personal preferences for Gibbs, as a PR professional I know he had an intense job. However, C.J. Cregg, he was not. President Obama did not leave his social media savvy behind when he moved to 1600 Pennsylvania Ave. I was a bit surprised to find the White House is all over social media. There has been a lot of criticism of President Obama about whether or not his promises for transparency were real. One thing you can’t criticize is the appearance of accessibility. Twitter feeds, Facebook and MySpace channels, Flicker and Vimeo feeds and a LinkedIn group. 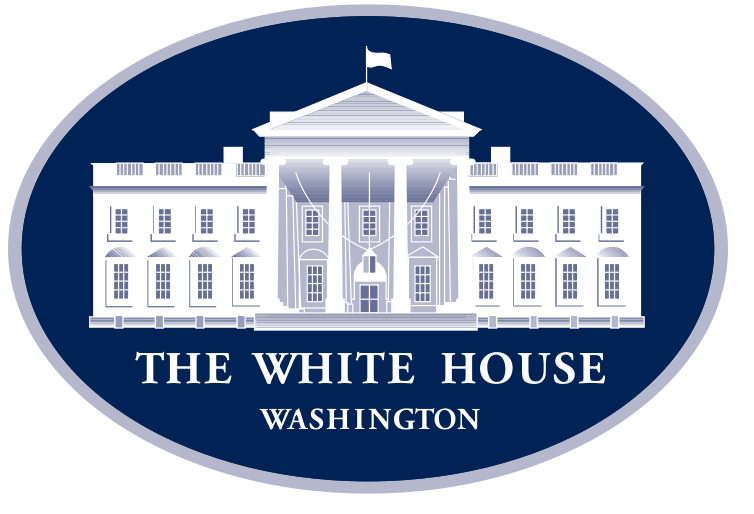 There is even a White House blog. I had no idea. If you want information that deals with the White House, you can find it with little effort. I especially like the White House YouTube Channel. The West Wing Week series is a nice recap of the presidential happenings. And the weekly mailbag is interesting. Some questions have answers that are more entertaining and better delivered than others than others, but hey, a question or two gets answered weekly by someone who knows something. Honestly though, I can’t bring myself to watch eight hours of forum presentations. Honestly, I can’t even bring myself to watch eight minutes of it. Kudos to the White House Communications team for their focus on social media. Keep it up. Do you think the White House Communications team is doing enough or not enough to keep the country informed? Tell us what you think about their efforts here or on our Facebook site and keep up with all of our blog postings on Twitter.